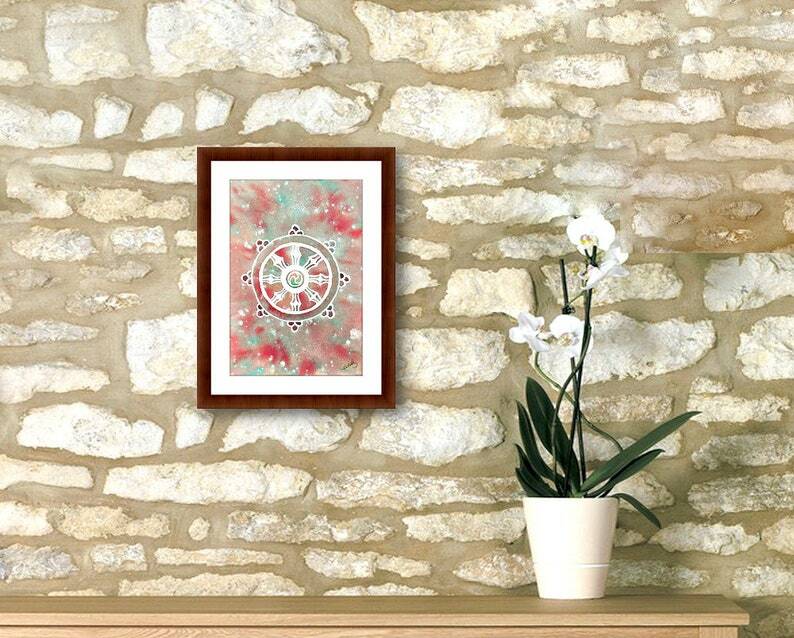 Dharma wheel watercolor painting, impermanence, good vibes art, health and wellness , home decorating ideas, gifts for expectant mothers. Spiritual art. It's a small painting that I made by watercolor; Dharma wheel is in the center; this painting is suitable for meditation; it promotes spiritual awakening. Made in Italy. It also represents the perpetual dissemination of Dharma. It is ideal for encouraging contemplation, the spiritual awakening. It also helps greatly in meditation, observing all forms of painting and entering into an inner world that is only yours. MATERIALS -> cotton paper, watercolors, acrylic paints, water, final protective varnish and glitter. All materials are highly professional. MAIN COLOURS -> dark green, red and white. Registered Mail shipment, free, traceable, secure, with estimated delivery times from 7 to 15 days* (Saturdays and holidays excluded). Sacred geometry jewelry with mandala and dharma wheel on pendant, mental health aware, gift idea for girlfriend, expectant mother, buddhist. Mandala necklace, buddha eyes tibetan pendant, healing heart reiki, health and wellness gift, fashion jewelry for women, for stepdaughters. Dharma wheel watercolor, original painting, new age spirituality, yoga reiki center decorating, peace and calming, meditation room decor. Mandala dharma wheel ornaments, balance necklace, compassion jewelry, birthday gift for best friend mother women sister, well-being support. Mandala necklace for spiritual enlightenment, soul searching, sacred geometry print, reiki pendant, rearview mirror decor for protection. Circle mandala necklace, amulet pendant, symbols of protection, emotional journaling, energy healing, mother's day present, free shipping. Mandala necklace, accept impermanence, meaningful jewel, for inner calm, vibrational energy, get well token, necklace for daughter from mom. Symbol necklace with mandala, a pendant worn to calm the mind, meaning of life, vibrational jewelry, wellness and health, vegan people gift. Om symbol necklace mandala wooden pendant square, mother of bride gift from groom, dharma day ideas, hand made in italy, pyrography art. Mandala round handpainted by italian artist, meditation accessories, yoga studio decorations, for living room, health and beauty center.